For the last week or so, Russ and I have been busy writing scripts for the first season of The Perturbed Dragon. It’s actually pretty easy to fill a page with words – the trick is to craft those words into something that’s worth watching! Fortunately both Russ and I are comedy geniuses and everything we write turns to gold! Well… that’s how we like to think about ourselves, anyway. In truth, writing comedy is really hard. Sure, we have plenty of ideas. Stuff we think will be funny or clever. But what’s funny to us isn’t neccessarily funny, or even interesting, to someone else. So I write a bit. Then Russ writes a bit and then I change what Russ wrote and he changes what I wrote. And then we fall out about the witty bit of dialogue that I insist is as funny as anything Ben Elton or Richard Curtis wrote for Blackadder and Russ insists is about as funny as dog leavings. And then we make up and try to write a line involving dog leavings. 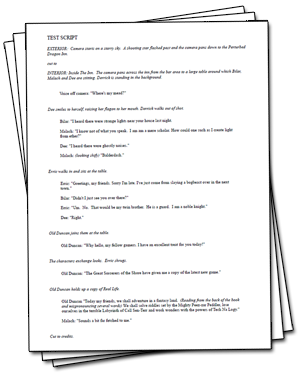 A typical script is about six pages long. We have six main characters, so we try and aim to give each character plenty to say and do. About a page each, right? Sometimes that’s easier said than done. One of the hardest characters to write for is Sheenah, the barmaid. It’s very tempting to simply have her drift by every now and again, bringing drinks or making snide comments, but really, she’s our Everyman. She’s the one on the outside looking in. If we need to explain something, it’ll be to her. Is someone needs to point out the ludicrousness of a situation – well, that’s Sheenah’s job! Oh, and she really really wants to get in Erric’s pants! You’d think that we would write the scripts in order, but we actually completed episode 3, ‘The New Guy’ first. In fact I’m pretty sure it wrote itself. We have already sent it out to our voice actors. Some of their work is just coming back in and so far, it sounds brilliant! Darren’s not a gamer. And he’s not funny. And I’m much better looking. He can do some fiddly “animation” stuff, but let’s face it: that’s not a valuable skill. So really it all falls on me to make this show good. The result is that all the good bits are mine, and all the bad bits are his. Only people with no soul think I’m not funny. Also, Russ doesn’t even have a beard, so how can he be better looking than me? Science has proven again and again the people with beards are more handsome, clever and funny than people without. Science also tells us that anyone who disagrees with this statement is a Communist.